Mortensen Construction Celebrates 35 Years! Read our January 2013 Newsletter. Come take a stroll with us down memory lane! The Ford Truck behind the guys was in a much newer condition than I remember it. We Mortensen kids affectionately referred to it as "The Green Beast". This truck served us well for many years, through many drivers, and for a couple hundred thousand miles, and helped us build many homes in the Treasure Valley and surrounding areas. Kent refurbished it once, but finally sold it off. Dave's awesome Grizzly Adams beard. He may not have that full beard anymore, but if you know Dave, you know that he is still a mountain man. It looks like Dave is wearing a Sta-Rite Truss trucker hat. Sta-Rite Truss, out of Kuna, provided trusses for all of our homes for many years and we have long enjoyed our relationship with the Young family that ran it. Kent looks to be wearing a BYU football stocking cap, obviously proud of the 1984 National Championship season. Kent has worn that same belt buckle as long as I have known him. Bonus points if you can tell me what the symbol on his belt buckle is and what it represents. A mustache is missing on Kent's upper lip, so he must have been serving in an LDS bishopric in Nampa at the time. That is one of the very few times his face has ever gone hairless. He'd often wear a beard in the winter and would come home with icicles hanging off it. 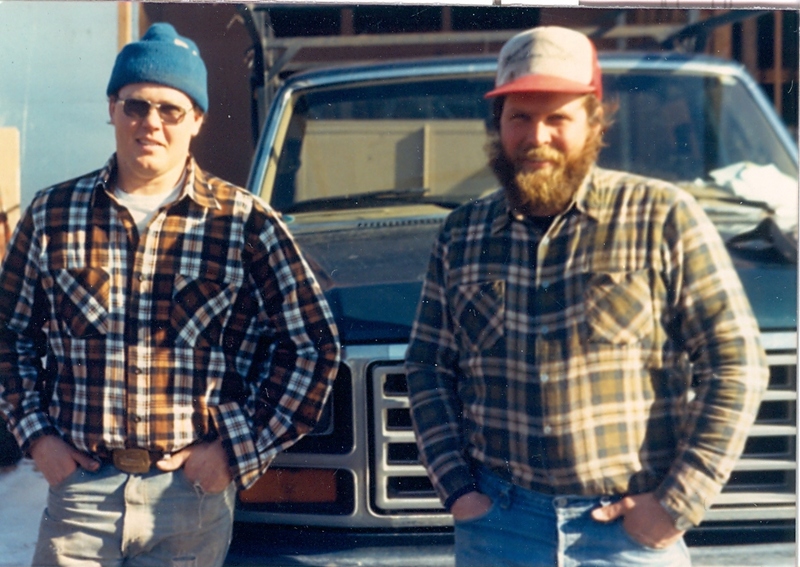 Sweet plaid flannel shirts. I think they're a timeless fashion. Stay tuned for more gems like this!